As a web marketer, you assume you have a small window to connect with prospects. When there are reports that suggest you have only seconds to sway visitors or lose their interest, it’s easy to assume short content is the only option. But the tides are changing, and it turns out that’s not the case at all. 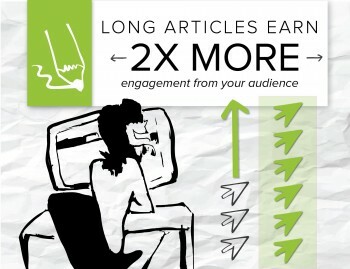 Long-form written content is becoming more popular in online marketing strategies because it’s having a huge impact on publishers’ results. Earlier this year, SearchMetrics released its annual Ranking Factors study, which showed longer content was more likely to rank at the top of results pages. We’ve seen the same with our clients who embrace longer content as a way to tell a story that matters to readers. One of our clients in the foodservice industry updated its strategy so it was publishing longer blog content less frequently rather than shorter tip-driven pieces. This adaptation gave the writer a chance to delve deeper into niche topics that we knew would appeal to the business’ target audience – chefs and culinary experts. Some might see this hyper-focused approach as a marketing risk. It’s the classic quantity versus quality debate. When you’re speaking directly to your target audience, you’re potentially isolating a larger – less qualified – audience that could be interested in broader topics or news. Or do you create resources for the smaller group of people who are more likely to purchase from you? In this case, the client had already built a steady stream of traffic to its site and knew it wanted to reach chefs and culinary experts. We felt confident moving toward a strategy that was based on creating content specifically for these readers. It paid off. The move to a more refined strategy was drawing readers who were more interested in the company’s perspective, products and services. It was evidenced by the fact that viewers entering on these pieces were spending more time exploring the site and viewing additional pages. This is what a smart content marketing strategy looks like. The content is created with the ideal customers’ interests in mind, and it attracts qualified visitors who are likely convert once they arrive at the site and see what the business offers. By embracing long-form content, this brand could give its audience even more of what it knew they wanted – and that move is paying dividends in the content analytics.